NailZilla: Nail art - Konad and neons! 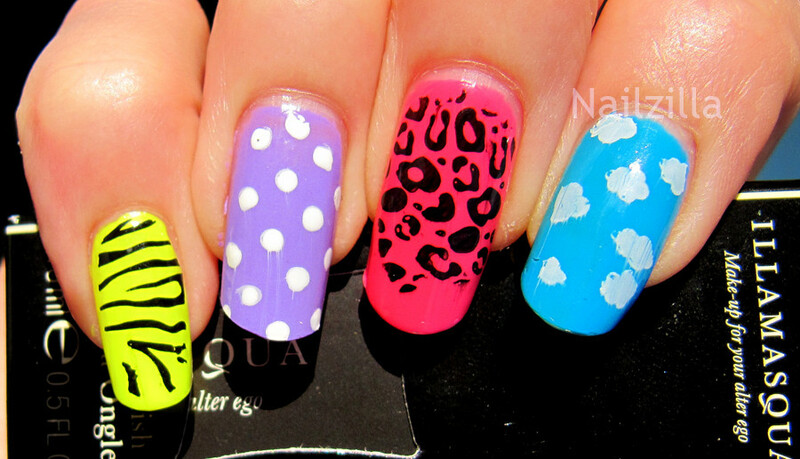 Nail art - Konad and neons! It's been a dreary spring and an even colder, rainier summer. This sort of situation calls for a neon... but which one? Why not all of them? I used SH Xtreme wear Blue Me Away, Illamasqua Collide, Jo'Mina and Rare from index to pinky. I love the Illa neons, they are so creamy and opaque and don't need underwear! After that, Konad plates and topcoat. Funny enogh, I can never get the designs to go full length of the nail... I have issues stamping because my c curve is very pronounced, so they either end up covering a half of the nail or smudging. However, it does get better with practice, so that's always encouraging. What are some of your favorite rainy day polishes? This looks great, I love all the bright colors! Yay for neons! I've never tried a Zoya polish but I do love the look of their flakies and their metally-looking bright shimmer polishes... they do that finish really well.